ON THE SUNDAY of Thanksgiving weekend, LA Clippers head coach Doc Rivers used his team’s halftime locker room meeting for one intended purpose. “He just challenged me,” Clippers rookie Shai Gilgeous-Alexander said. Rivers, an NBA rookie point guard 35 years earlier, had watched Lillard and CJ McCollum manhandle Gilgeous-Alexander all over the court in the first half — effortlessly running him off screens and carving out space with a bump and a stride, occasionally looking around for help after a blowby. Rivers had enough for an entire sizzle reel, but Gilgeous-Alexander didn’t need to watch a full-length feature so much as hear a message. And so he did. Lillard and McCollum weren’t fully taken out of their respective rhythms, but there was Gilgeous-Alexander in the third quarter, chest-to-chest with McCollum on a cut, intercepting the ball when it was lobbed McCollum’s way. The Clippers erased the double-digit deficit and escaped Portland with a win. After the game, Gilgeous-Alexander considered Rivers’ riot act at halftime and put a new item on his professional to-do list. Who is the best fit for this team? That depends on the future of the roster, and the Lakers’ priorities. “I want to have a game where I make no defensive mistakes,” Gilgeous-Alexander said. Both Cassell and Rivers admired the rookie’s resolve to fight over every single screen, to arrive promptly on the help side 100 percent of the time, to never reach, never not be at the nail when he’s supposed to be at the nail. But any player who has spent even a single possession at point guard at the NBA level also knows perfection is an impossibility. In fact, learning the position can feel like nothing more than a perpetual exercise in screwing up. All of those mistakes make learning the secrets of basketball’s most important but least understood position a daunting and exhilarating journey, challenging even the most ambitious rookies. Yet in recent years, as the NBA has accelerated into a constant offensive assault, the position of point guard has been transformed. Today’s point guard is still charged with the job of organizing an offense at high speed, managing the shot diets of teammates who are hungry for the ball, and initiating most actions in the half court. But in 2019, there’s so much more. The initiation is a baptism of fire, one both Gilgeous-Alexander and Atlanta Hawks guard Trae Young endured over the course of the season. The two players, both of whom will turn 21 this summer, are markedly different in their profiles. Gilgeous-Alexander is tall, long and versatile, with a keen eye for opportunities on both ends — crafty, in scout-speak. Young is small and not explosive in a traditional sense, but carries a innate ability to create offense. During the opening months of the season, both 2018 lottery picks were often overmatched. That’s not to say there weren’t glimpses of Gilgeous-Alexander’s agility and vision or Young’s freaky intuition as a budding pick-and-roll artist, but in regard to Nash’s checklist — servicing teammates, accuracy as a passer, efficiency as a scorer — neither displayed consistent proficiency. But over the course of the winter, both guards blossomed. Gilgeous-Alexander orchestrated an improbable playoff run with a roster largely filled with a combo of vets and rookies, and Young anchored a young nucleus during a classic rebuild. Both relied on the counsel of experienced mentors — Cassell for Gilgeous-Alexander, and Marlon Garnett (Steve Nash’s backcourt partner at Santa Clara) for Young. But neither rookie was furnished with a manual. It’s Jedi code, all unwritten rules and undefined criteria. The items that are defined — get the ball to your shooter on time — aren’t accompanied with specifics. On time for Landry Shamet or Kevin Huerter might be late for Danilo Gallinari or John Collins. “Every night it’s something different,” Young said. THE SAME WEEK Gilgeous-Alexander was the star of Rivers’ halftime slasher film, Young was mired in a woeful shooting slump — just 7-for-34 over a three-game stretch during which his team had dropped 11 of 12. In a loss to the Clippers and Gilgeous-Alexander just before Thanksgiving, Young scored 25 points (on a less-than-efficient 8-for-22 night from the field), and notched a career-high 17 assists. The next afternoon at the Hawks’ training facility, Atlanta coach Lloyd Pierce considered his young point guard’s performance, one he saw as a signal of important, if incremental, progress. After leading by 15 in the third quarter, the game tightened. Those surgical possessions when Young looked like a veteran point guard leveraging the Clippers’ defensive pressure for opportunities disappeared. Young was now a rookie again, one who somehow lost the confidence that guided those pocket passes. “Running point in the fourth quarter of a close game is graduate-level game management,” Pierce says. The game also confirmed an impression he’d developed over the first few weeks of the NBA season: that the pro game might be easier, in some respects, because defenses have to be far more accountable to the offensive weapons on the floor. “The schemes — I feel like they’re easier [in the NBA] because of the spacing,” Young says. Since summer league last July, Young has watched thousands of clips of point guards — Nash, Mike Bibby, Stephen Curry, Mahmoud Abdul-Rauf — curated by Garnett. Relying on Nash’s precept that defenses can help a point guard make better decisions simply by informing him of what’s most available, Young killed the league every which way in the season’s final months. After the All-Star break, Young averaged 24.7 points, 4.7 rebounds and 9.2 assists on a true shooting percentage of 58. Among the 194 players who passed the ball more than 500 times over that stretch, Young ranked third in shot quality off passes, according to Second Spectrum tracking data. A COUPLE OF weekends before the end of the season, Gilgeous-Alexander assembled performances in back-to-back home games that served as an almost perfect revue of his rookie season: On Saturday, fluid pick-and-roll play with Montrezl Harrell, hitting Shamet right on time coming off a baseline curl, and a perfect 3-for-3 night from deep in a 22-point, 8-assist performance with only a single turnover. This was followed on Sunday by a 6-point, 3-assist effort in which the struggles weren’t so much about a forgettable stat line as unevenness. The Lakers’ season is over. What’s next? • Is this LeBron’s new normal? Rivers recalls a couple of possessions when the Clippers didn’t get what they wanted offensively because Gilgeous-Alexander wasn’t timely with the pass. What Rivers described as honest errors that would go undetected in real time to all but the most advanced viewers can be measured, literally, in milliseconds. This litany of technicalities guides Gilgeous-Alexander’s development with Cassell, the least subtle man in professional basketball, on the most subtle particulars of playing point guard in the NBA. Gilgeous-Alexander has preoccupied himself with timing and pace since the start of the season. On nights in the fall when he was struggling, Gilgeous-Alexander noted that his errors weren’t rooted in carelessness, a lack of vision, or poor shot selection. When he didn’t execute, it was largely a byproduct of not calibrating his velocity and his decision-making to the demands of the game. And there’s another point guard both Gilgeous-Alexander and Young each independently cite when asked if there were active players in the league whom they studied closely for the kinds of secrets, hacks and shortcuts that you can only conceive of by observing first-hand: Mike Conley. “I became good at controlling pace and flow and feeling that throughout game because as I grew as a player, I had [Zach Randolph], I had Marc [Gasol], I had all these guys I had to get the ball to in almost scripted plays,” Conley said. As the point guard who moved the deliberate, slow-it-down Grit ‘n’ Grind Grizzlies into their offense against a league desperate to run his team off the floor, Conley had to wrest the pace of the game away from his opponents. Yet at the same time, the Grizzlies were a post-up team that was vulnerable to rigor mortis in the half court, which meant Conley couldn’t let the flow of the offense get too gummy, no matter how long Randolph held the ball on the right block. Gilgeous-Alexander names Conley as a point guard whose defense provided a smart template, especially given his listed 6-foot-1 frame. That week, Gilgeous-Alexander was focusing on defending at the point of a screen, especially after two November games in which he became intimately familiar with the body of Portland’s hulking center, Jusuf Nurkic, around which he had to navigate a few dozen times. Young faced up against Conley in his second career NBA game, and marvels at just how Conley seems almost telepathic in reading defenses. Conley said that, early on, he set out to create what amounts to a mental decision tree when confronting defenses in the pick-and-roll, a method by which pattern recognition would determine exactly what he’d do next against the defense. When Conley sees a trap, he’ll take one dribble back then try to immediately hit the pocket with the pass, or swing it quickly. Shortcut tends to have a negative connotation in basketball — a lazy gesture intended as a slapdash substitute for real work — but Conley’s shortcuts are the accelerants in a young point guard’s quest for greatness. Virtually every point guard hides a weakness — Gilgeous-Alexander will never have Russell Westbrook‘s first step, and Young’s size and frame make him a vulnerable defender. Success in the NBA is often the story of a very good player hiding a deficiency. AS PART OF the effort to empower Young as the point guard charged with leading the franchise forward, the Hawks handed him the pregame huddle. When it was time to break just before tipoff, Young would yell, “Family!” on three. Though there was no humor intended, teammates found it hilarious. “He has a real high-pitched voice,” veteran teammate Kent Bazemore says. When Young would yell, teammates would join in by mimicking Young’s Urkel-ian pitch. Young would be visibly irritated. On a team with 13 other jocks under the age of 30 (teammate Vince Carter was born in 1902), conveying embarrassment at being mocked is effectively an engraved invitation for more mockery. Gradually, Young acclimated himself to being razzed. When the team broke on a collective chant of Young’s high-pitched “Family!” Young would chuckle at the gesture. Then, maybe he’d go back at a teammate on the way out to the tip. When presented with rookie duties, like fetching cookies for a team flight or store runs on the road, he took it as an actual team-building exercise, even if it felt like ridicule. As Young got over himself, he became more efficient, more dangerous, and a point guard who could find shots for teammates, who themselves started to catch fire. Out in Los Angeles, Gilgeous-Alexander doesn’t have much of a choice — he’s subjected to Cassell for extended stretches nearly every day. Whether it’s an hour of player development on the practice floor, film study over a laptop or warm-ups, Cassell provides a running commentary that’s not without his customary ribbing. As Gilgeous-Alexander emerges from the home tunnel at Staples Center and trots to the court for warm-ups last winter, Cassell sings, “Who wears short shorts? Shai wears short shorts!” to the tune of a gaudy Nair spot from the 1980s. Gilgeous-Alexander then collects a ball and begins to go to work, dribbling from the elbow to the nail for a pull-up jumper as Cassell instructs him to use his eyes as a tool to deceive the defender. “I don’t give a f— if you miss the shot!” he yells. 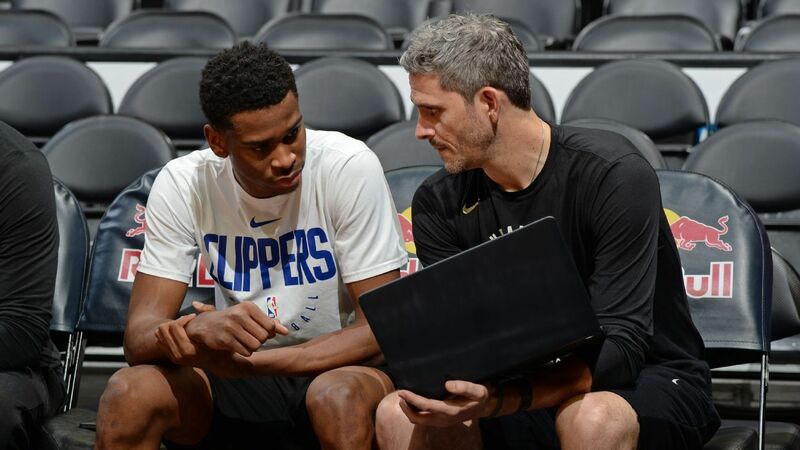 Clippers assistant coach Brendan O’Connor notes that Cassell doesn’t relent with Gilgeous-Alexander. Whether Cassell is recounting an anecdote or playfully teasing Gilgeous-Alexander, the rookie absorbs it, then moves on. “That’s his son,” O’Connor says. It’s very likely that at some point in this first-round series against the Warriors, Gilgeous-Alexander will get cooked by Curry, and when it happens, the best prescription might be laughter. “Early in the season when Shai was struggling, you could see it,” Rivers says a week before the playoffs. Rivers then imitates Gilgeous-Alexander, brooding, muttering “Jesus” to himself.